IF you were possibly one of those folks that threw a snit about a movie studio and did not go see The Hunger Games: Mockingjay Part 1 in theaters because they split ONE book into two movies, don't feel bad. Neither did I. But now your patience has paid off... if you were waiting that is. So set your DVRs or plan ahead for the upcoming world-television premiere on EPIX of The Hunger Games: Mockingjay Part I, this Saturday, July 25th at 8:00PM ET/PT. If you get EPIX. If not, it will be out on FX some day soon too probably at twice the length after they jam all the ads in there. The Hunger Games: Mockingjay Part 1 makes its World Television Premiere on EPIX on Saturday, July 25 at 8pm ET/PT, 7C. 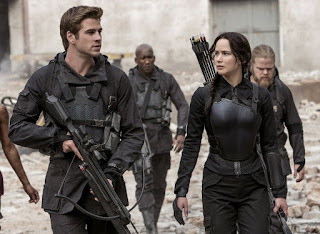 The Hunger Games: Mockingjay – Part 1 finds Katniss Everdeen (Jennifer Lawrence) in District 13 after she literally shatters the games forever. Under the leadership of President Coin (Julianne Moore) and the advice of her trusted friends, Katniss spreads her wings as she fights to save Peeta (Josh Hutcherson) and a nation moved by her courage. The film directed by Francis Lawrence, also stars Elizabeth Banks, Natalie Dormer, Liam Hemsworth, Philip Seymour Hoffman, Jena Malone, Willow Shields, Donald Sutherland, Stanley Tucci, Jeffrey Wright and Woody Harrelson. (PG-13).